Big Beat have been involved in a wide variety of successful awareness raising campaigns in relation to environmental issues, particularly recycling. These include working closely with the Environment Agency at numerous environmental fairs and festivals around the UK and more recently in bashing out the message to 'Rethink Rubbish' in Manchester, Nottingham, London's Leicester Square, Exeter and many more towns and cities around the UK. It's easy for the general public to switch off when they hear of yet another environmental horror story - Big Beat provide a different and vibrant way of re-engaging them. 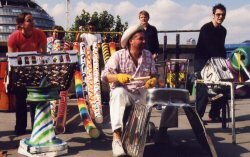 By producing music on recycled junk, and by using recycled materials in junk percussion workshops, Big Beat are an intrinsically environmentally friendly band and can promote awareness of environmental issues in a unique, accessible and fun way. Big Beat's wide appeal - everyone from toddlers to senior citizens soon succumbs to the infectious beats - ensures that the message of re-use, recycling and rethinking rubbish reaches an extraordinarily diverse audience. Big Beat offer a wide array of flexible performance and workshop solutions that can be easily adapted to form part of any dynamic recycling awareness campaign. From corporate team building workshops using recycled junk instruments, to blasts of percussive noise in town squares, encouraging audience members to pick up recycling information, from performances at conferences, festivals, functions and events, to workshops in schools which offer the younger generation the chance to discover how much fun (and how noisy!!!) recycling can be - Big Beat drum the message home in their own inimitable style. Big Beat perform at numerous high-profile events all over the UK and Europe (and occasionally further a field!!) Combined workshop participant and audience member numbers total approximately 200,000 / year (not including television performances!!). In-depth scientific market research (a quick straw poll of fan clubbers!) has identified that audiences and workshop participants associate Big Beat with noise, fun, energy, colour, vivacity and vibrancy. Our gigs and workshops could provide an ideal platform to distribute information, brochures, leaflets and / or to promote a specific environmental message or campaign. We are also able to offer environmental organisations advertising opportunities in a number of areas. On our instruments (gas pipes, plastic barrels, kitchen sinks and a whole host of industrial waste), on our performance and workshop attire (stylishly modelled by Big Beat's performers and workshop leaders) and on our websites (increasingly popular for fans and corporate contacts alike) and many other exciting options. In other words a walking, talking, banging, funking, moving, dancing publicity and awareness raising machine.